Steven (Chicagoland, United States) on 7 March 2019 in Plant & Nature and Portfolio. This is a spectacular rare elephant ear that originally was available only to the Hawaiian Royalties. The 3' tall leaves are heavily spotted with paint-like white flecks. The markings are random and no two leaves are the same. 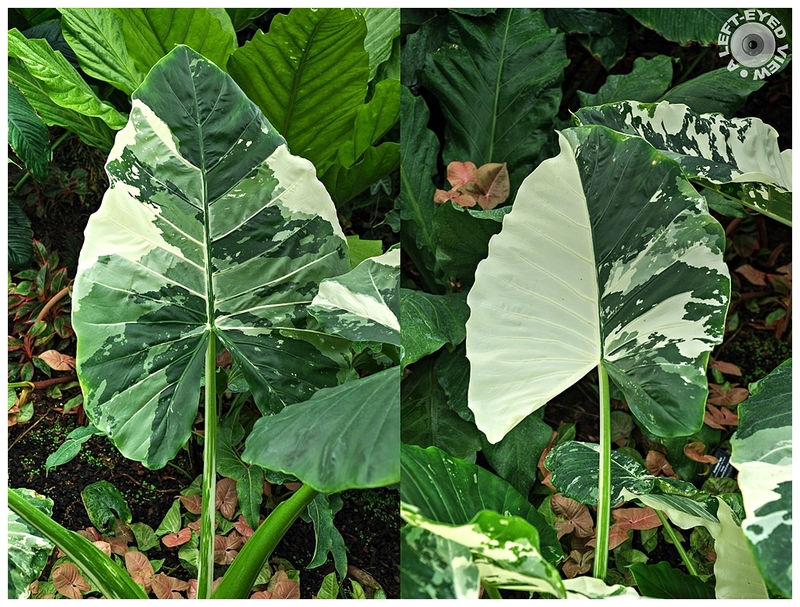 Some of the leaves may have white spots as large as half of the leaf (right photo) and others have freckles. Spotted in the Aroid House at the Garfield Park Conservatory in Chicago, Illinois on February 2, 2019. Really beautiful and impressive leaves. Very nice colagework. Well done! Here the leaves are plain green and very smooth. We cook even the leaves !! Full of vitamins! J'aime les différents tons de verts. Elles sont superbes ces feuilles dans leurs nuances de teintes. Excellent look at these leaves Steven. Nice work. Beautiful capture of these special and superb leaves ! Very original these leaves ! so beautiful and well presented ! Just got back from tropical Malaysia two days ago! Came across some of these giant taro leaves out there too. Sadly, none of them were as pretty as these variegated leaves. Gorgeous leaves. The spots of color variations are stunning, like art! This is very specific the white spots. Amazing leaves and quite beautiful, too. Etonnant, avec toutes ses nuances du vert au blanc. This is so interesting! I love the patterns and the different shades of green. It makes beautiful artwork! You have them outside? lucky you! Wow, I've found every green tone! Beautiful. A lovely two panel presentation. This is a welcome sight to my winter-tired eyes. That is, all the leaves are really unique. Nature has really wonderful things. Impressionnantes oreilles d'éléphant !!! Et cette particularité d'être différentes c'est étonnant !!! Des feuilles très étranges presque albinos. I've always found these so unusual - how asymmetrical the patterns are!